Delta once again has a flash sale. The one from last week is still ongoing for another day or two but they released a first class flash sale as well. This is similar to the one they launched around the holidays last year. The catch with this one is that the prices are for one way travel but they require a round trip booking. I am not sure if that is truly enforced or not though or if the one way prices will show this cost anyway. Let’s take a look. This was my third visit to Salt Lake City, but the first time I actually visited the lake! Tickets must be purchased no later than January 29, 2019. The fact that Delta is requiring round trip purchases and because the time frame is so limited this a not so great deal. I think it is a little bit of a shady move to advertise one way prices but require roundtrip travel. If you are flying these routes anyway it may be worth looking into though. I attempted to book DTW to MEM one way just to see. The cash price was about $100 higher than the listed price on the sale but the miles price was only 3000 miles higher. 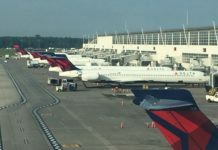 So these routes are most likely discounted overall and you may be able to book one ways with Delta Skymiles for near the prices listed above. I think the cash deals are the better offer for the most part unless you have a ton of Delta Skymiles. It may be worth checking the Chase Ultimate Rewards or Citi ThankYou travel portal to book the cash travel because we should always be using our points! Previous articleSouthwest Status Match Offer: Get Free A-List Status, Plus Fly and Extend Another Year! Time frame covers Easter I believe….so anyone who has spring break that week and has waited for flights to drop…this might be of use. Good point Shaun I had not thought of that.